Gremikha (Iokanga) is the second onshore storage site at the Kola Peninsula for spent nuclear fuel from submarines. Around 800 elements from pressure water reactors are stored in Gremikha, containing 1.4 tonnes of nuclear fuel materials. A further six reactor cores from liquid metal reactors are also stored onshore. Spent nuclear fuel remains in the reactors of all of the 6-7 submarines laid-up at piers at the base (as of July 2003). The Gremikha naval base is the easternmost Northern Fleet base at the Kola Peninsula, located some 350 kilometres east of the mouth of the Murmansk fjord. There is no road or railway connection to the base. Today, there are no active submarines based at Gremikha; only 17 nuclear-powered submarines withdrawn from service with their 34 reactors are laid-up at the base. The submarines are both first and second generation vessels. There are a total of 14 piers at Gremikha, of which seven floating piers berth the laid-up submarines. Most of the piers are in a unsatisfactory condition. Project 671 (Victor-class), 12 units: B-53, B-306, B-323, B-369, B-513, B-517, B-398, B-438, B-367, B-387 and B-370. The storage sites for spent nuclear fuel and radioactive waste are built around the dry dock SD-10, which was earlier used for refuelling submarine reactors. The dry dock, a floating technical repair base and its surrounding facilities are located in Chervyanaya Bay, near the settlement at the base. Most of the facilities were constructed in the 1950s and 1960s to serve the Northern Fleets first generation submarines. Then, in the beginning of the 1970s, the base was partly reconstructed to serve strategic submarines of the Project 667 (Yankee-class). 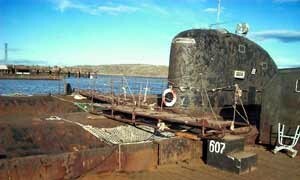 In the 1980s, dry dock SD-10 was partly reconstructed, enabling to refuel the reactors and store the reactor cores from liquid metal cool reactors from Project 705 — Alfa class submarines. At present, no part of the storage site meets the normative requirements for radiation safety. Today, the dry dock SD-10 (142 metres long and 17 meters wide) is not in working condition. There were plans to repair it assuming the availability of funding. Because of its remote location, much of the work to secure the waste has to be done onsite. Also, many of the laid-up submarines at the base are leaking from their ballast tanks, reducing their floating capability and thereby making it too risky to tow them away to another naval yard on the Kola Peninsula or to Severodvinsk for decommissioning.